Blessedologist | My Cup Runneth Over! For the past couple of years, I have been asking the question, “What is my purpose?” “What am I supposed to do with my life?” I was having a conversation with a friend of mine at work the other day and we were talking about determining our purpose. She was sharing that she thought by the age of 30, she would have completed certain goals. But, here she is on the other side of 30 and those goals had not been reached. I explained to her that I have been feeling the exact same way. True, my purpose of being a wife and a mother is being fulfilled. However, deep inside, I know there is so much more. I am not sure what is really my purpose? In my mind, my purpose is something that I can do with little effort. Yes, I have to work at it but it will come with little effort. It is something that if I were not paid to do it, I will still do it because I enjoy it so much. My purpose is something deep inside that should drive me to take it to another level. With that being my understanding, I have yet to determine what my purpose is in my life. Here I am at the age of 44 and I do not know what I am supposed to do with my life. We all have gifts and talents but are we walking in our purpose? Each day I ask myself that question. My husband says that I am scattered because I go from one thing to another. Yes, that is so true because I am trying to find what it is that I am supposed to do. Is going from one thing to the next when it does not work the way I think it should work, a good idea? Probably not! But, in my mind, that is the only way that I will know what is that I want to do. Even my son keeps asking me almost weekly, “Mom, what is that you want to do?” Every week, I have the same response, “I don’t know!” Isn’t that horrible? At my age, I should already know what my purpose is for my life. But, the truth of the matter is that I do not. I pray daily for an answer because I am tired of feeling like I am wasting my life away. I just believe there is so much more in store for me. I just wish I knew what “that” is for my life. I wonder how many people the same way. What is your purpose or do you know? It has been quite awhile since I posted anything on my blog. I wish I had some funny excuses but in all sincerity after taking the new job opportunity, I have been unable to adjust. Returning to work has been a great experience on one hand; however, on the other hand, I feel totally out of touch with reality. As a former SAHM, I was actively involved in the lives of my children. I would go on field trips, meet with the teachers after school when I picked up my daughter, have lunch with my son and complete homework with them when they came home. NOW…that’s not even in the cards. There are days when I feel like a bad mommy and the guilt feeling overtakes me. Yes, my husband is at home to pick up the pieces, drop off the children to school, cook dinner and keep the youngest child at home to help save daycare costs, but it is still not the same. On top of keeping up with schoolwork, three of the 5 children were involved in soccer this year, which meant two practices a week and 3 to 4 games on Saturday and possibly one on Sundays. Oh, let’s not forget that I am a Leading Lady of a church. In addition, returning to work has caused my house to go lacking. It was depressing to come home to a house that looked like nobody cared. Don’t get me wrong, the house was not dirty dirty, but it was definitely not the way I like to keep my home. So, during my week long Thanksgiving vacation, I cleaned my house. Now, the house is where I need it to be whenever I come home and I am no longer feeling overwhelmed or depressed when I walk through the doors. The challenge is keeping it this way until my Christmas break. This definitely was not the way that I wanted to spend my break. But, it needed to happen. Needless to say, going back to work has not been easy but the door was opened and I had to step through it. I am taking it day by day, moment by moment. Do I want to come home and become a SAHM? YES! YES! YES! I love being at home! But for now, this is my season to work. I am going to make the adjustment. It is just taking longer than I expected. At the end of the day, I am going to keep pressing and remind myself that even though I am busy and tired, I am BLESSED! I wish Beba Bean Design had been around when I was having babies. Even though that time is up for me, I look forward to giving these gifts to other mothers who are taking on the life of motherhood. beba bean Designs have the cutest baby clothes. They are sponsoring a giveaway for a $25.00 Gift Card to their website to one lucky winner. You can use it on anything in the whole store. The Giveaway Starts July 15 and ends July 29. Open to US residents only. Be sure to check out Tales From A Southern Mom’s Review on beba bean HERE! And Another Door Opens Again! God always opens a door when you least expect it. Beginning on July 7th, 2014, I will walk through another door that GOD has opened for me. Do I really want to go back to work? Hmmmm…. It’s a question that I ask myself everyday, along with other questions such as, “Why has this door opened again this time? Why is the door always opened when I am not searching for a job? Why now? Is it worth going back to work with all the expenses for childcare, after school care, gas, clothes, etc. ?” Naturally, I do not have any answers other than the assurance that there is something on the other side of the door and I must walk through it. Since the layoff in 2012, I have enjoyed being a SAHM. I love being available for my family. I have heard friends in my son’s class say they wish their parents could have lunch with them or come to the parties at school. This breaks my heart but the reality is that parents must work in order to provide for their families. Additionally, the reason I like being a SAHM is that I have flexibility when the kids are sick or when I need to take them to their many appointments. Last but definitely not least, it just cost less to stay at home with 5 children. Nevertheless, the door of opportunity has opened and it is time to walk through it. It’s not like this is the first time that this door has been opened. In 2003, I became a SAHM by accident due to a lay off at my job as a Business Analyst. I stayed at home with the first 3 children until 2009 when the door of opportunity opened to return to work. However, at that time, it was not as hard to return to the workforce. Why? I am not sure. But this time around, I am struggling with the decision. I am happy but not happy. I am excited but not excited. However, I am grateful because there are many people who are looking for jobs and are unsuccessful in their search. This is definitely something to keep in mind when I need an inspiration. As a new blogger, this is great information. Whether you’ve been blogging for a decade or for a week, sometimes it can feel like inspiration has taken a day off. Next time that happens, give these post ideas a try. It’s sometimes easier to put your own thoughts into words when someone else’s words are already there on the screen. Have you come across a powerful quote in the news, or read a great opening sentence in a novel? Is there a line in a song you’ve recently heard that you keep thinking about? It started about 5 years ago when I decided to do the BIG BC (big chop of course). It was a scary feeling but I knew that I needed a change. At that time, I only had one daughter who has a head full of hair. I wore the low hair cut for about 3 years and LOVED IT! Then, I had a fourth child..thankfully, he was a boy! But, then I wanted a change. I started growing my hair back and I thought it would be easy! WRONG! After baby #4, my last baby was born 2 years later and the baby is a GIRL! Now, I have two heads of hair to comb plus mine. Let’s just say that was not settling to well with me. After much contemplation, I decided once again it was time for a change! Something had to give and why not start with me, especially since I despise combing/styling my own hair. I had to make a decision between growing locs or pay to have braids in my hair every two months (which would cost about $250 every two months ). Since I am budget conscience, I figured growing locs is the best option…at least that is what I thought. The process of growing locs is long and tedious. You must have patience because your hair WILL go through changes. When it is first done, it looks great but during the locking process, it becomes messy since you are not doing anything to it except tying it down at night. This is where the patience kicks in and frustration sets in. 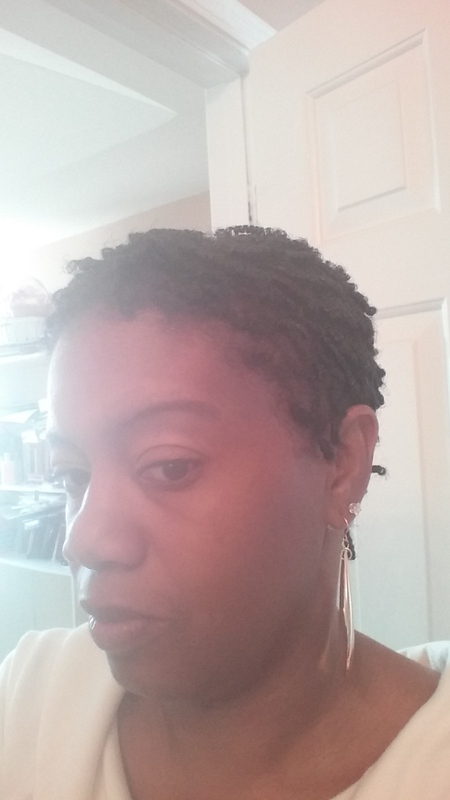 On April 30, 2014, Monique combed out each two strand twists, locs and interlocks which had developed in my hair. It only took 7 hours!! PSA: You can take out your locs without having to do the BC. When all was said and done…hydration, deep conditioning and about an inch of trimming, I had a SHORT Afro. However, at the end of the day, I have healthy hair and NOW THE JOURNEY BEGINS! The journey begins with combed twists. The DVD player is a MUST! Stop! Leave me alone! Don’t do that! Don’t touch me! Are we there yet? The radio is too loud! I don’t like that song. It’s too cold…no it is not! Yes, it is!! On and on and on it goes until at least the youngest three fall asleep. Then there are a few moments of peace and quiet. And I do mean just a few moments. Then it is back to the exchange. Hence, the reason why the DVD player is a MUST HAVE on road trips. For our trip to Destin, FL, we decided to rent a van instead of putting the miles on my 2005 Honda Odyssey which has a DVD player. Yes, I use movies to have some quiet time in the car while I am driving, especially since I drive a lot. When my husband reserved the car, he specifically asked for a Chrysler Town and Country because we KNEW it had a DVD player. However, when we went to pick up the car, Enterprise only had a Dodge Caravan which did not have a DVD player. Naturally, I was not happy because I had checked out videos from the library to avoid as much bickering as possible. Can you imagine riding 5 to 6 hours with kids ages 14 to 2 years old? If they were quiet, it would not be a problem. However, my kids are boisterous, independent and bold. This is why I prefer driving at night while they are asleep. Therefore it is a MUST…a REQUIREMENT…not an option to have a DVD player in the car for our next vacation. Mix in a Healthy Lifestyle! Visit our new site http://internetsuccess4you.com!